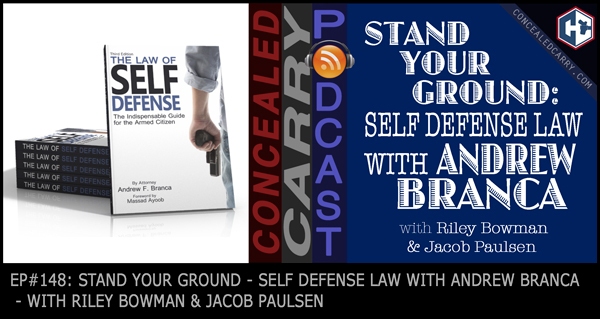 Riley and Jacob had the privilege of interviewing Andrew Branca, the top attorney in the U.S. for all things self-defense law. Andrew is the author of the book The Law of Self Defense and is an experienced attorney who teaches at the FBI's National Academy, has taught at Sig Sauer Academy, appears on the Outdoor Channel's TV show “The Best Defense”, and writes extensively for websites and blogs online including the National Review. He is often quoted as a subject matter expert on use-of-force law by major national print and broadcast media. He regularly consults with attorneys across the nation on various self-defense cases. In this episode we get into “Stand Your Ground” law, “Castle Doctrine”, “Make My Day”, how to deal with law enforcement and the consequences immediately following a defensive gun use. Don't miss it!! Press ‘PLAY' above to listen now! Should You Attend the NRA Carry Guard 2017 Expo? I enjoyed episode 148 where you interviewed Andrew Branca. I am reading his book and learning a lot from it. I am training for my NRA firearms instructors certification. In other classes I have heard others talk about something that I am curious about, and I expect it to come up in my classes when I start training others. Many firearms related podcasts (even yours, I think) talk about, and seem to promote the idea of being a so-called Sheep Dog. The term implies that individuals without law enforcement powers are how empowered to protect society in the way that sworn law enforcement does. My question is, have you discussed this idea with Andrew Branca? As an expert in his field, I would love to hear his take on this idea of Sheep Dog thinking as this goes to a state of mine, as mentioned by your guest when referencing bumper stickers, embellishments, on firearms, etc. Specifically, would those who promote the so-called Sheep Dog mindset have some level of culpability in the event of an incident. 1. They must be in your home. 2. They must have something that can hurt are kill you on them. 3. You must have no way out. Are no place to run. 4. If you are on the street. You must try to run. Are find a way out. If you can’t. They you may use force. To defend yourself. 5. If you do use your gun Are something to defend yourself/family. REMEMBER GOOD. DO NOT! DO NOT! Talk with the police. Just give your name & ask for a lawyer. Then shut up until you have one with you. Know your rights & use them. Also. get ready to get sued by the thug. Are his family. Saying he was just a good old guy having fun. f you think I’m kidding. I’m not. The law is back words in cesspool USA. “must be in your home” is 100% inaccurate. You can say you generally have more access to “self defense” legal defense in your home, but “must be’ is wrong. In most US jurisdictions protecting yourself or a stranger from imminent unlawful harm on the street is actually a way stronger defense than a theft of property from your home. And modern firearms training does NOT say “do not talk to police.” It says limit what you say. There is plenty you could say that might disqualify or reduce your claim t self defense, or simply be contradicted by forensics and damage your credibility (ie if in the adrenaline confusion you say you shot twice and in fact forensics shows you shot for times). if the case is that someone broke in your door or window, came in, you confronted him, told him that you had a firearm and told him to get out and he advanced on you with a what looked like a firearm or a knife or threateningly brandished screwdriver, and you shot; that would be a good summary to tell responding officers (assuming it is true). It is when they ask for further details that you want to say that you need to talk to a lawyer first. As far as no place out and nowhere to run, firstly this depends entirely on whether you live alone. If a family member lives with you you do not have to abandon them to a dangerous and threatening criminal. And in fact lots of “outs” may not be safe. If he came in the front, but you heard something out back, you may not be certain your retreat is safe. If you have a reason to think it maybe a team of home invaders, running out another door into the dark might be dangerous.